Research in Motion executives came out in force Thursday evening in New York, playing hosts at the industry launch of the PlayBook tablet in an effort to convince market watchers and potential users that the device is a serious contender in an arena dominated by Apple’s iPad. The event was a party, rather than a traditional announcement, with a DJ spinning songs and bars and tables set up for cocktails. Company officials mingled and glad-handed with the crowd rather than taking to the podium with canned speeches. 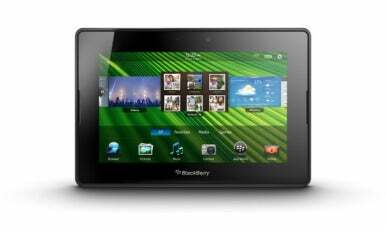 But the PlayBook, due to go on sale April 19, faces an uphill battle, even though some early reviews have praised the user interface, based on software acquired when RIM bought QNX, a maker of operating systems for mobile devices. The tablet sports a 1GHz dual-core processor, two high-resolution cameras—one in front and one in back—and micro-HDMI output. It’s priced at $500 for a version with 16G bytes of storage, $600 for a 32G-byte version, and $700 for 64G-byte model. On the software side, many early reviewers have cited a litany of shortcomings, the most egregious of which may be a lack of a built-in e-mail program—the main feature that draws professionals to the company’s iconic BlackBerry smartphone. To do e-mail on the device, users have to establish a WiFi connection to the Internet and use a browser-based application like Gmail, or establish a Bluetooth link to a BlackBerry via a feature called Bridge. Via the Bridge function, users have access to all their BlackBerry apps. The device weighs just under a pound and has a 7-inch screen, roughly half the area of an iPad screen. That, however, is one of the main selling points for Co-CEO Mike Lazaridis. In a nod to the QNX-based operating system, Lazaridis emphasized the touch-screen interface’s ability to allow users to smoothly move from one open app to another. “The way this thing multitasks, it’s like one step ahead—I can do things as fast as I can think,” Lazaridis said. But the PlayBook lacks what many users would consider basic features such as a built-in calendar, contacts database, and chat application. When the device goes on sale, there will be about 3,000 third-party apps available, compared to the 65,000 on the App Store for the iPad. “The PlayBook is a race car that’s missing a wheel,” said Sarah Rotman Epps, an analyst with Forrester Research. “This is a very, very powerful platform, a very, very powerful device and it’s a good proof point for the future of RIM … but it’s missing some key components for consumers. It’s missing a native e-mail client and Forrester’s data shows that the number one things consumers do on tablets is e-mail,” said Epps, who attended the launch party. Support for Flash may even things out a bit with the iPad, she added. “Forrester’s data shows that 23 percent of consumers considering buying a tablet say that the number of apps is in their top three criteria for buying a tablet, 19 percent say that Flash support is (important)—so the PlayBook loses to the iPad in the app battle, wins in the Flash battle,” Epps said. The tablet market is growing, and should reach the point where there will be room for multiple vendors to be successful, analysts pointed. Some CIOs meanwhile, are taking a wait-and-see attitude, even though the BlackBerry has been a corporate staple. “The jury’s still out,” said Gregg Davis, CIO for Webcor Builders, prior to RIM’s launch event. Over half the mobile phones in his organization are BlackBerry devices.